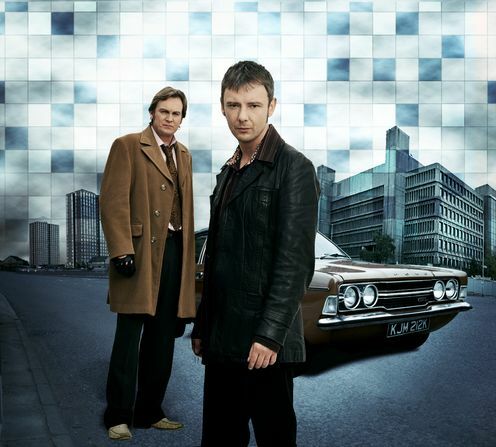 Life on Mars is a surreal, gripping and sometimes amusing [the writers chose the 70s for a reason] BBC original series, Detective Inspector Sam Tyler [John Simm] gets hit by a car in 2006 and wakes up in 1973 in his own Manchester precinct. He cannot believe it is 1973 or any of this is real. This is the nightmare from which he cannot awake. Everything is foreign to him and he cannot grasp how outdated and seemingly backwards everything is in 1973. The other detectives behave boorishly and in an unregulated manner that often does not sit well with Tyler. Yet to work with this force, he has to come to terms it. And in Series 2, he looks the part even though he acts much more modern. Tyler’s friendship with Annie [Liz White], an officer in the women’s division of the force [he treats her as an equal and values her input on cases], blossoms into a romance. Finally! There was so much will they/won’t they in Series 1. Life on Mars makes everyone in 1973 daft, chauvinistic, and almost savage. Tyler has managed to break many of his fellow officers’ of their bad habits but he still has issues. Now Tyler is back out on cases, trying to stay sane from the voices he hears in his head [hospital monitors beeping, his mother calling his name] and strange people in the street and television characters talking to him. In the past, he runs into his greatest case from the future who he now believes is tormenting him at his bedside. Tyler is obsessed with taking this guy down NOW in the 70s. He’s in limbo: getting called into the future but physically stuck in the past. Life on Mars is a well-written, clever program with a mix of vintage and present tone and style. The tense storylines and unpredictable nature of the show will keep you on edge, particularly with the intense ending. This entry was posted on November 26, 2009, 08:05 and is filed under DVD. You can follow any responses to this entry through RSS 2.0. Both comments and pings are currently closed.